The following therapy tale came from Tom O'Connell, of Liverpool, New York. 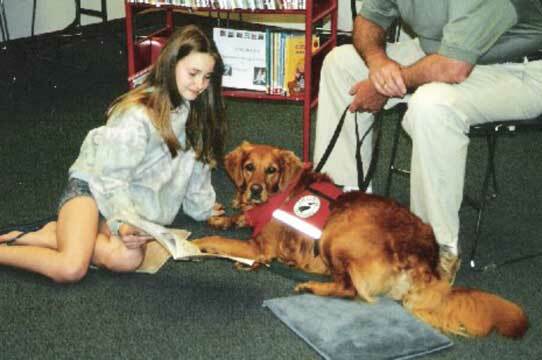 He and his special 5½-year-old Golden gal, Daphne, are doing some enormously inspiring work. We had to be there by 1:30 pm. We were visiting pediatrics at University Hospital that day and didn't want to be late. We arrived at the hospital a little early since Daphne had not worked much over the holidays. 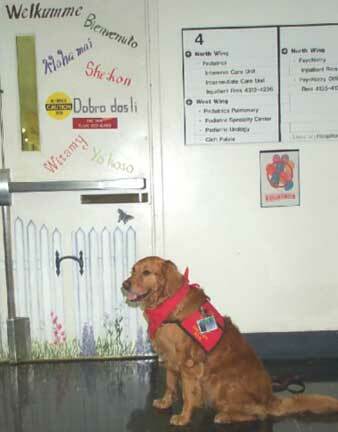 We went to the volunteer services office to hang up my jacket and clean off Daphne's paws. After signing in and getting a quick drink, we were off to the lobby to hang out for a few minutes and get acclimated to the hospital environment. I sat in a chair and Daphne lay by my feet with her bandana and therapy vest on. It didn't take long before we had a group of people surrounding Daphne wanting to know all about her. The questions came fast and were the same ones we hear often. "Is she a pure breed? Is she a Golden? Is she a puppy? I've never seen a Golden that reddish color before. She's smaller than the Goldens I normally see, why? I took a few moments to field the questions to everyone's satisfaction before looking at my watch and realizing it was time to head upstairs where we were scheduled to visit. We waited for the elevator and when the door opened there were two men inside. I asked if they minded if the dog rode and they said no problem. On the second floor we stopped and a bunch of people entered the elevator. Daphne just sat there checking out all the new folks. One of the women who got on board noticed that there was a dog sitting in the back of the elevator and informed all, "Hey, there's a dog back there". Again we answered questions about Daphne's distinctive Adirondac Golden look. After making stops at every floor we finally reached our destination. Waiting for us was the Child Life Specialist who would be accompanying us on our rounds. 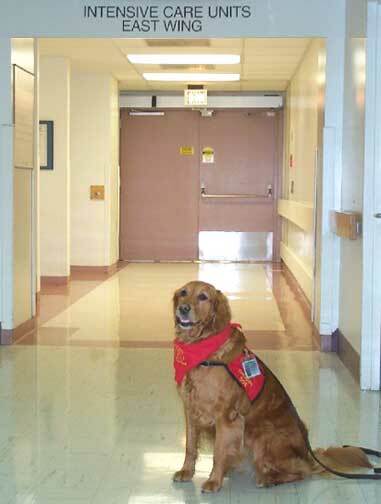 After she greeted us (Daphne more than me), we headed off to visit our first patient. Walking into the room we found a young child in bed who was visibly ill and had undergone many difficult times coping with Chemotherapy treatment and an amputation. Daphne wiggled her way towards the child as I decided how to position her since we do not always allow them into the beds with all the patients. Daphne, however, has it figured out already. She decides on the half-on approach, keeping her hind legs on the floor but stretching her front end as close as possible to the child, looking for signs of encouragement. A wide grin spread across the girl's face as she stroked Daphne's head. "Her fur is so soft" she said. We spent the next fifteen minutes talking about this Adirondac looking little Daphne dog and how she wormed her way into a young girl's heart in a very short time. As the visit winds down I give her one of Daphne's business cards which are photos as a way of remembering the special time they spent together. Outside the room the Life Specialist apologizes for not warning me ahead of time about the child's condition. Don't worry about it, Daphne didn't. Working with Daphne has been so rewarding. Unlike working for modern day companies that want to do more with less, and never say that you did good today, I always feel like I made a difference in someone's life after finishing a visit. The group I belong to is called Sunshine Friends, Inc. We also just started visiting at the hospitals high risk pregnancy unit, as well as doing Adult Oncology end of life situations.